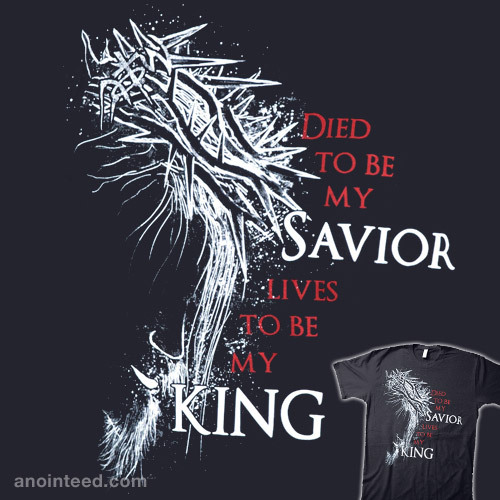 Jesus died to be my Savior [but] lives to be my King. Why did Jesus die for us? So that we might have eternal life and that through us. “[He] might display His perfect patience as an example to those who were to believe in Him for eternal life. To the King of ages, immortal, invisible, the only God, be honor and glory forever and ever. Amen.” (1 Timothy 1:12-17). The Bible states that we have “been crucified with Christ. It is no longer [us] who live, but Christ lives in [us]. So [we] live in [these] earthly [bodies] by trusting in the Son of God, who loved [us] and gave himself for [us]” (Galatians 2:20). Use this NOTW tee to make a statement and witness to others!